This last weekend we had the second annual sausage fest (I'd call it Sausage Fest 2009 but I think the first one was January 2009). In attendance were Sap House Bill, Matt the Vegetarian Butcher, Farmer Todd, Budgie Joe, and the Tile Hooligans. 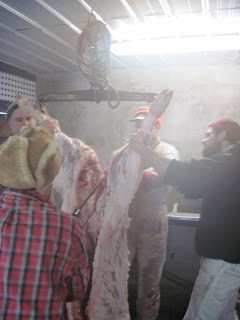 We started about noon on Saturday with the dispatching of the hog, and by 3:30 it was hanging to chill over night. The weather turned out to be just about perfect (25 degrees) to chill the carcass. Sunday morning we started at 8 with boning out all the meat, and got the grill going to cook the ribs. We made the three kinds of sausage again this time, a Mexican chorizo, a sweet Italian, and a breakfast. It ended up to be about 100 lbs of sausage all together. Lookin' good! Great weather for such a project. This is the second annual Sausage Fest people here make the best sausage food.One of the made sausage had been shown here .They have the best collection.